“I have never been more excited than I am now about how God is moving the Church of God into a bright future!” Sounds like something the general director of Church of God Ministries might say. Or a member of the Ministries Council. Maybe even someone applying for a leadership position in the General Assembly. But these words come from the pastor of one of our most influential churches in the movement: Bob Beckler, of Central Community Church in Wichita, Kansas. The Wichita congregation will host what is shaping up to be a must-attend Church of God Convention in June 2017. Before you go, get to know this 110-year-old church whose vitality and drive for ministry is nothing short of contagious. 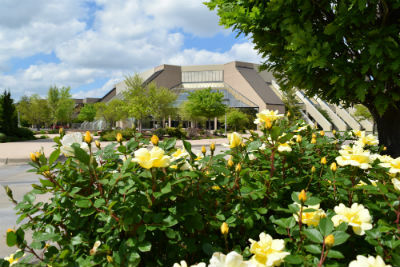 Photo: Flowers bloom outside of Central Community Church. Photo: CCC, a Jesus-centered church! The name of their church is so fitting for what they do. As a central gathering place, they now host extravagant Christmas and Easter productions attended by thousands of locals. 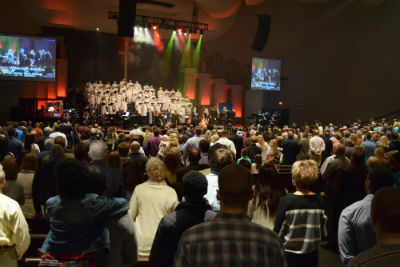 Pastor George Skramstad is back at the church where he led so many years in worship, and now he’s helping to revitalize the grand-scale choral, worship arts aspects of what they do. As a hub for the community, they’re keeping the facilities in tip-top shape. But before the new coat of paint, the congregation wrote more than 1,300 scriptures on the walls to symbolize the power of God in what they’re doing there. But these believers don’t just stay on the church property. Through an effort known as The Dollar Club, each month they’re taking funds raised out to the needy to pay for gas or electric bills, offering financial assistance to families of prisoners, surprising police officers with gifts, and much more. The church video records the acts of kindness and shows the entire congregation what their dollars can do. This only motivates the church to give more, and the cycle of being Jesus to the community continues. “Know Christ and Make Him Known”—from providing family-friendly activities at the church, to local and international missions, everything Central Community Church does stems from that new Jesus-centered mission statement. Pastor Bob and Central Community Church can’t wait to see brothers and sisters in Christ from across the country and around the world gather in Wichita next June. 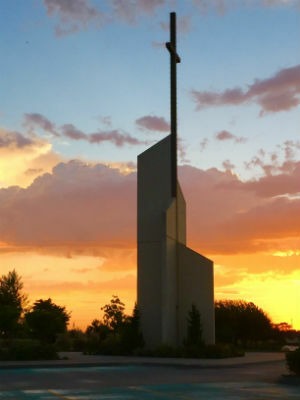 As they roll out the welcome mat, they also recommend a few eateries: Freddy’s, an old-fashioned hamburger establishment, as well as a variety of great barbecue places in Old Town Wichita, and the classic chains McAllister’s and Chick-Fil-A—both of which regularly partner with the church. Pastor Bob also reminds everyone that if you like Pizza Hut, you might like to know that it originated in Wichita! As for things to do, Pastor Bob recommends Old Town Wichita, the Riverwalk, the zoo, and the incredible Museum of World Treasures—founded by a friend to so many in the movement, Jon Kardatzke. Church of God Convention 2017 is next June 20–23. For registration and more information, visit www.JesusIsTheSubject.org. This entry was posted in All Church of God, Church of God Convention and tagged Bob Beckler, camp meeting, Campmeeting, Central Community Church, CHOG Convention, church growth, church health, Church of God Convention 2017, George Skramstad, Kansas, KS, NAC, North American Convention, Reclaim 2017, Wichita. Bookmark the permalink.